Sports, sports, sports: the era of athletic fashion isn’t slowing down any time soon. Just ask the designers and their recently runway-ed collections for Men's Fashion Week Spring/Summer 2019 in Paris and Milan. French luxury labels continued to craft active and street wear, as seen in Virgil Abloh's debut for Louis Vuitton and Kim Jones for Dior Homme. Valentino favoured the millennial with a logo-centric collection, while Comme des Garçons' reworking of the suit was one of the only major shows to highlight tailoring. In case you missed it, here are the seven best Spring/Summer 2019 fashion shows from Men's Fashion Week. Virgil Abloh’s first-ever show as artistic director of Louis Vuitton menswear did not disappoint. To a 250-metre rainbow-striped runway, set in Paris’ Palais Royal, Abloh sent out a collection that was equal parts sporty and utility, with a flash of luxury for opulent measure. An evolution of colour, the Off-White founder first delivered all-over white looks, which evolved hyper-fast into tie-dye smocks, exotic material worker jackets and colour-blocked tailoring. Keep your eyes peeled for a Wizard of Oz ‘Dorothy’ floral print windbreaker next spring, which closed the star-studded show. The French maison’s newly appointed creative director Kim Jones (ex-Louis Vuitton) paid homage debut to the man who started it all, Monsieur Dior, in his debut collection. Held inside the historic Garde Républicaine army barracks in Paris, the clothes—like Dior’s founder—favoured nature with embroidered topcoats, shirting and Baroque-printed shirt/short combos. Labours of love include the translucent plastic outerwear, the natty wraparound sixties suits and Dior Homme’s newest blazer for men: a double-breasted jacket called the ‘Oblique’. Next summer is all about the suit, according to Rei Kawakubo, who sent out a bold Comme de Garçons collection for SS19. The Japanese designer’s insignia was the three-piece: relaxed cut jackets and pants in hyper-coloured textured nylons, as well as utility-strapped varieties and black dinner jackets with rouched pants—the latter worn with white shirting and tie for a contemporary take on formalwear. The show’s jewellery was the jaw dropper, literally, as iridescent and garish suits were adorned with trophy necklaces including gold chains strung with animal parts, including a mound of eyeballs and, you guessed it, jaws. Olivier Rousteing strikes again. The illustrious French designer for Parisian house Balmain sent out a SS19 collection inspired by The King of Pop. In addition to the obvious leather shoes, white socks and that silver glove, Balmain play on Michael Jackson’s sequined jackets, red leather bikers and cricket blazers in black and white. Fans of the brand’s logo will also love the longline merchandise-style t-shirts inscribed with Balmain On Tour. Rock on. 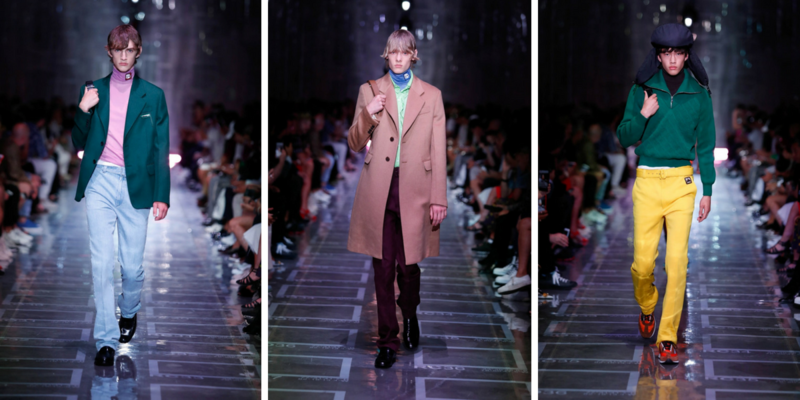 Tired of baggy sportswear and streetwear, Prada showed a more elegant men’s collection this season as seen in the very lean, clean silhouettes and jacket fits, colour blocked with a jewel-tone roll neck. Retro shorts were also key to the Prada portfolio, worn under spread-collar polos. The standout pieces were without a doubt the chic tracksuits and camel overcoat. Accessories also showed stylish restraint, ranging from nylon sacks with drawstring ties to larger leather carryalls and a plush nylon trapper hat. Like most old guard fashion houses, Valentino continue to go casual this season, sending down the Milanese runway a millennial-mad collection that was all about logos. A new fuchsia pink VLTN logo covered everything from a classic check coat, camo zipper jacket, jeans, a bucket hat and leather belts. Retro Valentino monograms from the seventies also made an appearance. Animal embroidery starred on tracksuit tops and coats. The brand’s high-end leather sneakers also got an exotic makeover with snap-off tabs featuring ostrich feathers. New to the men’s fashion game, The Beatles’ scion closed Milan fashion week in style, hosting an exclusive garden party for the Stella McCartney man and all of his fashion friends. As models lazed around red and white checked tables laden with pizza and played garden games like table tennis, the looks on show were just as effortless. Jazzed up with a touch of British elegance, the clothes were cut in traditional fabrics like Prince of Wales checks and embellished with sport and couture details. Stella’s eco-friendly ethos informed her line of men’s accessories, with bags and rucksacks made from recycled polyester and solvent-free polyurethane.